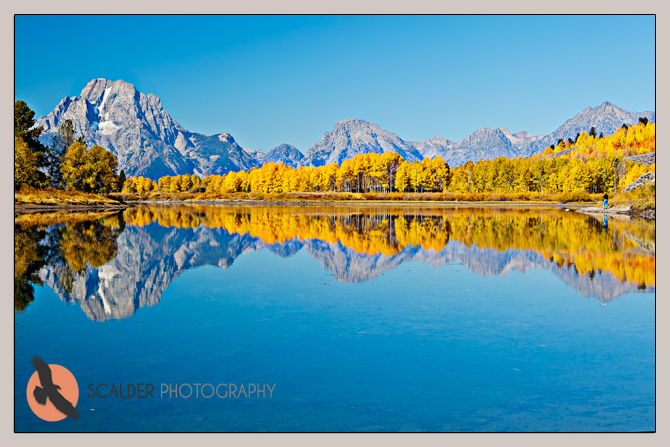 This image is Ox Bow Bend in the Grand Tetons National Park in Wyoming. Mount Moran is in the distance and the Snake River winds around the mountains reflecting the mountains and the trees. The aspens are bright yellow and the colors are quite vivid. This scene is photographed millions of times by tourists and photographers but I couldn't resist! I used my 70-200 at 98mm, f 7 at 1/800th of a second. If you look closely there is a photographer with a tripod on the shore on the right side of the image to add scale and some interest. This entry was posted on Thursday, April 19th, 2012 at 4:49 pm. It is filed under Animals / Wildlife, Landscape, Nature, New Images and tagged with aspens, Autumn, colors, fall, fall colors, Grand Tetons, mountains, photographer, reflections, Rocky Mountains, USA. You can follow any responses to this entry through the RSS 2.0 feed.